Cloud intelligence locates the pain points in your SQL Server environment. With months of performance data at your disposal, monitoring your on-premise SQL Servers can now be done faster and more efficiently than ever before—thanks to the power of our cloud application. Familiar with the 3 a.m. panic-stricken phone call about the database being down? With over 150 alarm types, you always know if there is a problem with your SQL Server. 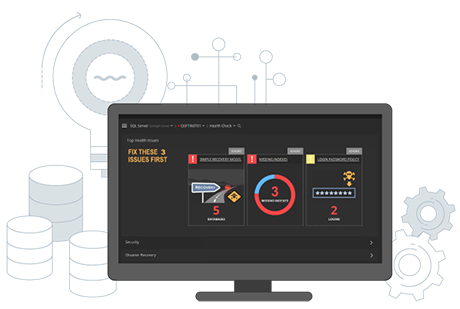 We've taken 20 years of experience in providing SQL Server monitoring and performance diagnostics and made it easier for you to analyze issues and understand a path to resolving them. Seventy-two percent of DBAs say managing database performance is their most important responsibility. Get started in as little as 10 minutes.